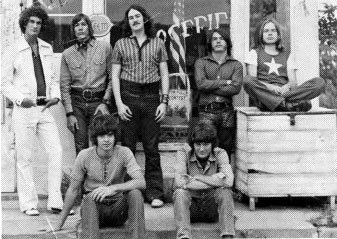 When it came to being top guns on the North East and Eastern Iowa rock scenes in the late 60’s and early 70’s, 1964 was the year The Pages from Oelwein, Iowa started their rock and roll journey. 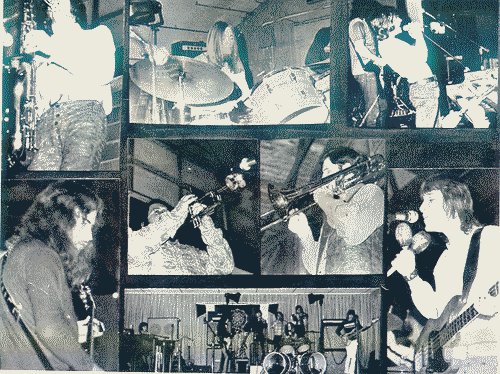 The original lineup included: Ken Barry-drums, Jim Hines-guitar, Paul Bezilia-bass, and Rich Michael-keyboards.They got their start by working with KOEL’s DJ, Jack Mihall at the famed Lakeside Ballroom. By 1968, they were top draws across Eastern Iowa, and parts of Wisconsin and Illinois. Their key markets were any of lowa’s famed ballrooms. From Matter’s in Decorah, to The Lakeside in Guttenberg, to The Hi-Way Gardens in Stanwood, to The Dance-Mor in Swisher, they set attendance records wherever they played. In 1968, Berry was replaced on drums by Bill “Saki” Megonigle. In 1970, they added a tight horn section in the form of Jon James-Sax/trumpet, Mike Rouse-trumpet, and Jim Enke on trombone. 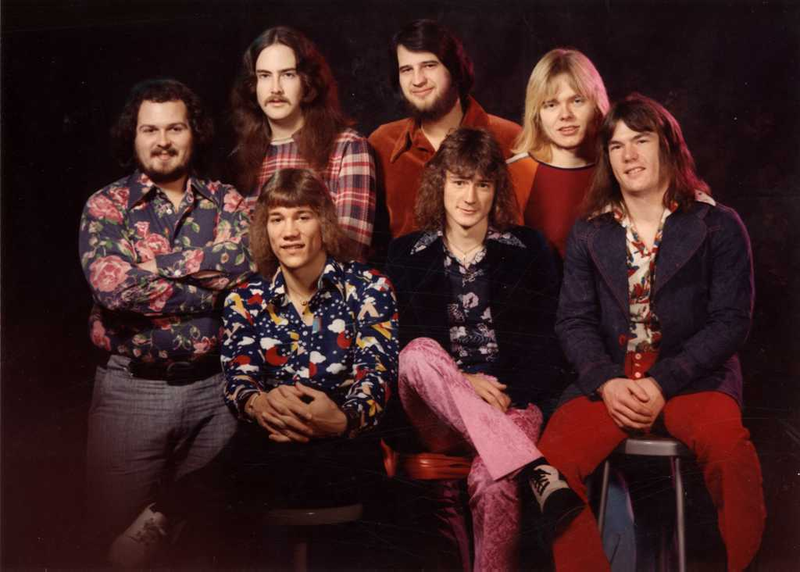 By 1971, Megonigle left the group and was replaced on drums by Denny Carlson. In 1972 new horn players were added who included: Al Naylor-trumpet and Loren Fagen-trombone. During their career they played with the likes of the New Colony Six, Paul Revere & The Raiders, Climax, and Tony Orlando & Dawn. In 1968, they released their solo recorded effort, “High School/Sugar On The Road” (UA Records 54300). In the years that The Pages were together, they left quite an impact on lowa’s rock music scene. See the Official Pages website that has the complete history of the band. See the Iowa Rock and Roll Hall of Fame induction of The Pages. I’m workin’ on a list of all Iowa garage bands that made 45 r.p.m. recordings during the 60’s. I’m also trying to listen to and collect as many of these recordings as possible. Is there anyone out their in rock’n’roll-ville that has “The Pages” 45 record of “High School /Sugar on the Road” that I could listen to? Perhaps share on youtube or send me a tape? I’d appreciate it. Kelly, It’s funny you have that memory…I was at the Sacred Heart gym that afternoon also. Obviously, didn’t stay as long as you did, but I remember them working through Saturday in the Park… Chicago released it in July 1972 and it was a brand new song so it would have been that summer. And every time I heard that song from that point on, I always thought of the Pages playing it in the Sacred Heart gym. So cool John. Nice to know that you were also there to verify I wasn’t making the story up.. Another thing that happened that day was outside the NW corner of the gym (by the bandroom) where the Pages bus was parked for unloading. Apparently they had gotten a wooden bar stool somewhere and they were sawing off the legs to shorten it so that Rich Michael could use it while playing keys. I know that is not groundbreaking info, but it was still part of my “going to school” by watching a major band doing their day-to-day band business. Sometimes bands need to be carpenters too! The Pages were a huge influence on me as a teen. I used to beg my older brother for a ride to see them at Dreamland Ballroom in Postville, since I did not have a driver’s license yet. They were outstanding. Besides the popular songs of the day, I heard many songs I hadn’t heard before by the likes of Rory Gallagher, Detroit & Dave Mason. Same with Oelwein band Sound Incorporated. They used to play teen dances at the Wadena Gym when I was in 8th grade. They introduced me to The Allman Brothers & Humble Pie, among others. Greg Ohl had joined the band by this time. The Pages totally changed my life. I had the opportunity to watch them rehearse one Saturday afternoon at the Sacred Heart Gym. They were learning “Saturday in the Park” by Chicago and every band I have been in since then, I used what I learned that afternoon about how a band rehearses new songs. I never really knew how to organize a band practice until I watched the Pages that afternoon. More information regarding my experience watching The Pages practice session where they learned and rehearsed a new song. NOTE: This information may not be interesting to non-musicians. First of all, the horn section went by themselves into the boys locker room and worked out all their parts before coming back to the band practice. When they came back to the stage, they had their parts ready. Lesson learned: Do your homework outside of band practice so that the rest of the players don’t stand around while you are learning your parts. Secondly, very rarely did they practice their new song from beginning to end. They broke it into sections.They practiced the intro until they got it right. Then they worked on the verses. Next they worked on the chorus. Then they worked on the bridge and finally they got to the ending section. Also, they would start a section and stop it when something did not sound right. And then they would dissect and discuss what did not seem right and try it again. This idea seems basic now, but at the time, watching a band jumping from section to section without really playing the entire song from start to finish was something very foreign to this snot-nosed kid who was trying to start a band and practice songs without really seeing how it is done by professionals. To restate, the song they were learning was “Saturday in the Park” by Chicago. They eventually got to the middle bridge section and were having problems with getting it right. They went over the section many, many times and they could not figure out what was wrong. Finally, Hines said, “Wait,… the drums should be playing a different beat during this section.” Once they became aware of that, they made their adjustments and moved on. To this day, every time I hear that song on the radio, I wait for that middle bridge that starts with “Slow motion rider……” and I still notice how the drum beat changes. Lesson learned: Break the song into sections and master each one before you try to put it all together. Also, you have to listen closely to all the intricate details of a song to be able to cover it in a way that will capture the essence of the song. They also spent time working on vocals only. They practiced their vocal harmonies with only a guitar or piano playing along….not full band. Lesson learned: If the vocals are not right, the song is not right. Most people will not appreciate how much time you spent learning that fancy lead guitar part. Most people only relate to the vocals. And finally, there were no egos involved. They worked through all their parts and were having fun doing it. They worked together as a team to come up with their best effort. Lesson learned: There are good times and there are bad times in band relationships. But to be successful and enjoy what you are doing, you have to avoid personality conflicts that will get in the way of success. It was so cool to come back to Sacred Heart Gym later that night and wait for them to play that song I watched them practice earlier. They did not introduce the song as a tune they just learned earlier in the day. They just snuck it into their existing set list like they have been playing it forever. Lesson learned: Good bands stay fresh with new material and they do not need to call attention to songs that they have never performed live before. I knew, and The Pages knew, that that was the first time they ever played that tune, but everyone else in the packed gym had no idea on how hard they worked to get that song ready just hours before.